Rapid Menu Writer is a wizard for creating very simple DVD menus. Rapid Menu Writer is fast and efficient! It can add a menu to a DVD in seconds, and uses only a fraction of your hard disk space. 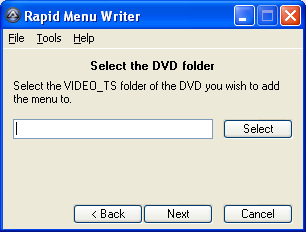 Rapid Menu Writer automates two well known software packages (PgcEdit and DVDStyler) in a manner that takes the difficulty out of adding a menu to a DVD. The result is a very simple to use and reliable wizard that anyone can use. Fixed the Back buttons (broken from v1.1). Fixed the Finished message at the end to be shown (was previously hidden). Changed the DVDStyler Preview message to include Yes and No buttons to continue or go back. Added an error message when the DVD player doesn't exist when Play DVD is clicked. Updated the error messages for missing PgcEdit and DVDStyler executables to include the path. Added a "Restore Defaults" button to the Options GUI. Added verbose logging to the "Assign commands to the menu buttons" section. Changed the style of menu buttons to use frames with borders. Changed the default menu colour scheme to be blue buttons with white text and borders.